Choosing a good business VoIP provider will make the difference between professional, smooth, and enjoyable service and wishing you’d never crawled out of bed in the morning. With so many options out there offering relatively similar features packages for comparable pricing, it can be hard to know which one is the right one to choose. And, it only gets more confusing when comparing two companies that are genuinely good choices. 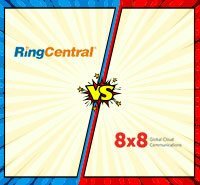 Today, we look at RingCentral and 8x8, two major competitors in the business VoIP world to see not only what they have to offer customers but who fares better when put in a head-to-head competition. Take a look. RingCentral is known far and wide as being an industry leader for VoIP calling among businesses everywhere. It has loads of integration options, a great mobile application, and excellent pricing packages. RingCentral’s service is also proven to be clear and smooth, giving it a comfortable standing at the top of the competitive chain. 8x8 is another great name in the VoIP marketplace. This is the little guy’s plan, and it also helps businesses that work internationally keep communications solutions affordable and manageable. With easy setup and strong customer support, 8x8 keeps your business connected all the time. RingCentral and 8x8 are both cloud-based providers, so you don’t have to worry about complicated setup procedures, expensive hardware, or complex wiring issues. Instead, you can rely on your internet connection and a standard VoIP phone for either service to be up and running within minutes. RingCentral uses mostly Cisco and Polycom, though there is a wireless Yealink device too, while 8x8 offers Yealink, Spectrum, Cisco, and Polycom phones. In either case, you should look to third party sellers for price comparisons before purchasing the actual phones. Setup and account management is handled via an online admin portal. This is convenient because you can access it from anywhere and at any time, and it requires no IT professionals on hand. This is where you’ll set up things like your auto attendant, extensions, and personalized greetings. In our opinion, RingCentral has a friendly user interface. With clear sections, explanatory icons, and simple commands, the system is super simple to follow. What’s more, RingCentral provides how-to videos for each step of the setup and management process. That means you won’t have to sit there scanning through loads of options and text files to find and execute what you are trying to take care of. 8x8 has a good introduction to its platform, providing an hour-long session with a technician to familiarize yourself with all the details of your account. This is a really great feature for people who prefer guided study type systems learning. However, an hour is a long time to invest for some business-minded folks, and many prefer to dive in and learn on the job. Both providers offer integration with most commonly used CRMs, so you’re probably covered one way or the other. Of course, if you specifically use a system that does not integrate with one brand or another, that makes your choice easier. For example, 8x8 doesn’t have Oracle or Box integration, while RingCentral won’t comply nicely with SugarCRM, NetSuite, or ACT!. 8x8 wins this section of the battle, but only because it offers a single integration more than RingCentral. As we mentioned, both systems are easy to use and integrate with your current CRM. Both RingCentral and 8x8 offer mobile apps for easy mobile integration and are both available for iOS and Android devices, as well. RingCentral's mobile app kicks off with a smart tutorial and includes pop up hints and tips for quick solutions. See your call logs, messages, contacts, and a quick Dial pad for easy calling on your mobile device. 8x8 has a fresh, modern look to its app, something most users will appreciate. It's easy to use too, with an intuitive UI and clear menu. The customization and options are somewhat limited though, making it less appealing than the RingCentral version, and the meeting feature is not fully functional yet, a big drag. Both companies also have mobile apps that work smoothly for on-the-go business calling. When it comes to more advanced features from 8x8, the number and extent of features you get will depend on which plan you opt for. 8x8 has a powerful offering known as Virtual Office. This package includes things like SMS services, softphones, and conference calls. It also has call recording and online fax capabilities for the Pro version. One thing that 8x8 is uniquely known for is compliance with several regulating bodies such as HIPAA and FISMA. This is a bonus for businesses that work in the healthcare sector, in particular. • Unlimited voice conferencing. Users also get the convenience of screen sharing that makes team collaboration, video presentation, and product launches so much easier. RingCentral’s pricing plan is complex, to say the least. While this is something that most users don’t appreciate, the fact that you get a lower rate for each tier of users will certainly make up for the initial confusion. RingCentral’s Standard package, for example, ranges from $19.99-$49.99 because users can choose between an annual plan, a monthly plan with a contract, or a monthly plan without a contract. Additionally, the number of users you have signed up will alter the price. So, an annual plan for 5 users will cost you $24.99 per month per user, while an annual plan for 100 users will only cost you $19.99 per month per user. 8x8's pricing plans are called Metered, Unlimited Extensions, and Global Extensions, and each comes with benefits. For example, the Metered plan provides the basic calling services good for small businesses. You'll get unlimited inbound calling, unlimited calling within the 8x8 network, 250 minutes outbound to US and Canada, and a rate of $.029 per minute, after that. The Global Extensions plan is the same as the Unlimited Extensions package with even more global coverage, accessing calls to 40 countries including ones in Latin America, the Middle East, and several other European and Asian countries on top of the Unlimited Plan coverage. Calls outside these countries are still competitive at $.034 per minute. Then, you can also upgrade the plan to Virtual Office Pro for a fuller set of features. 8x8 does charge a $39.99 a one-time activation fee upon sign up. RingCentral is overall a better value for your money option because it has better per user pricing, offers more features within its standard package, and provides unlimited calling where 8x8 makes you pay. However, companies should note that businesses that do a lot of international calling may benefit from 8x8’s unlimited global calling plan even more (assuming you are calling one or several of the countries listed on 8x8’s accepted international calling list). RingCentral has good 24/7 online chat, phone support, and a comprehensive online knowledge base that gives you loads of information about integrations, systems management, calling, and account settings. 8x8 has an excellent resource section on its website that makes self-help troubleshooting a breeze. It provides user guides, setup guides, and community connections with other 8x8 users so you can ask your questions to real customers who have used the systems already. This type of crowdsourced customer support is unique in the industry, and it really gives 8x8 a competitive edge because sometimes it’s easier for you to speak to a peer about an issue than struggle to explain things with a technical representative. Not everyone appreciates having to fix problems on their own, however, so 8x8 also offers phone support and an online chat function. As you can see from this review, it's a fierce competition. While 8x8 has excellent integration options and the most competitive offerings for international business callers, RingCentral wins this battle for its competitively priced per user packages, outstanding features suite, and smooth and simple user interface that makes startup and account management simple. Both are good options to work with, and as mentioned previously, if keeping phone bills down with low international calling is your main concern, definitely check out 8x8's competitive rates. 8x8 vs Nextiva: Which Business VoIP Provider is Right for Your Business?